The scent of fresh rain is one of my favorite scents in the world. Yes, it can get old easily if the rain doesn’t stop for days. But at the sight of a much needed rain fall, I always feel such a sense of peace and calmness in my life. (Don’t get me wrong…too much rain can be disastrous!) Yet much, like the waters of my Baptism, the rain washes away all the dirt and makes things clean again. In addition, growing up with my Dad, Uncle, and Grandparents who farm, I also know the vitality of rain to the harvest season. And that is the thing, friends, God’s grace does rain down on us. God’s grace rained down on me during my seminary journey. God’s grace rained down on me when I went to work at Super Awesome Bible Camp. God’s grace rained down and continues to rain down on my family as we journey the path of mental illness. God’s grace rained down on us during our parent’s divorce. In fact, the more I think about, the more and more I see the fingerprints of God’s grace in my life. The truth is that God’s grace continually rains down on us through life’s joys and sorrows. And God’s grace continues to rain down on you too friends!! Yet God always comes and rains down on each and every one of God’s people! Friends and Readers, I am so excited for YOU! 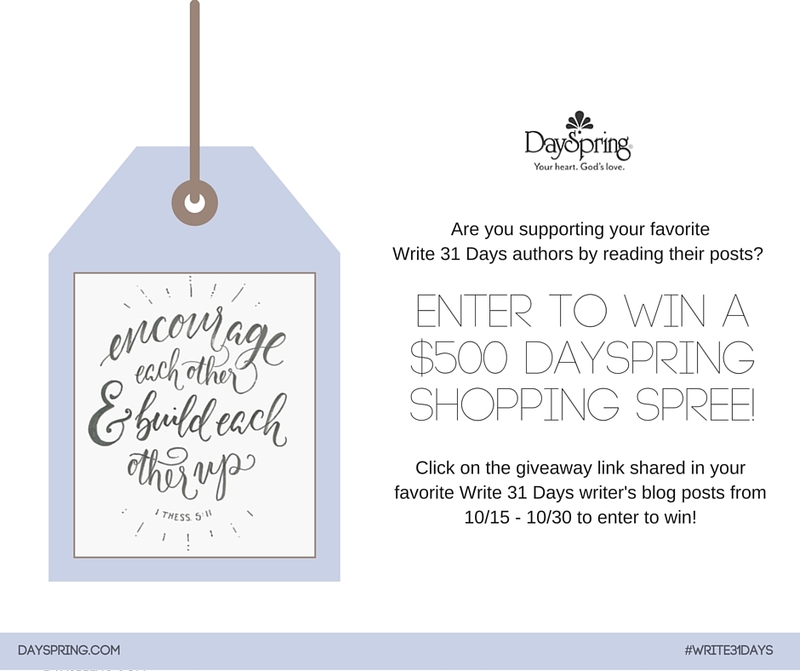 DaySpring.com is celebrating all of the amazing Write 31 Days readers who are supporting nearly 2000 writers this October. To enter to win a $500 DaySpring shopping spree, click on this link . Good luck and thanks so much for reading. This entry was posted in Uncategorized and tagged #write31 days, 31 Stories of God's grace, Chris Tomlin, Grace Like Rain, rain by tara.ulrich. Bookmark the permalink. I love that song. Even though I've heard that song often, I haven't really got hold of that concept of grace being like rain. Such an encouragement to me today. And yes, it definitely feels like God is in a completely different time zone sometimes! Glad my words encouraged you today. I am so glad to know that I am not the only one who sometimes feels like God is in a completely different time zone. That is one of my favorite contemporary songs. Grace rains down and washes away all my sins. I love the concept. God is in a different zone, I think. He ways are so much higher than ours. Thanks for commenting today on my blog. Awesome! I love the concept of grace raining down and washing away my sins too. I am so glad I could stop by your blog too. It takes a lot of grace to be absorbed in hardened hearts. I'm so glad Jesus never runs out! God's AMAZING grace never ceases to sooth my weary soul!!!! Praise God!!! Love your heart sweet friend!!!! Praise God! Thank you Larissa! Blessed to be reminded that we can be washed in God's grace. Love the song, and love your thoughts! Amen! I'm so glad that God's grace cleanses me and refreshes me and causes new growth in me. Helen, so glad you loved this post! Thank you for saying my post was beautifully written.